Music credit: Mozart's Così fan tutte. Amanda Roocroft (Fiordiligi), Rosa Mannion (Dorabella), Rainer Trost (Ferrando), Rodney Gilfry (Guglielmo), Eirian James (Despina), Carlos Feller (Don Alfonso). John Eliot Gardiner, conductor, with the English Baroque Soloists, 1993. Deutsche Grammophon. Excerpt from Mozart's Le nozze di Figaro. Herbert von Karajan, conductor, with the Wiener Philharmoniker, 1952. EMI Records Ltd.
Hello and welcome — my name is Stéphane Mayer. I'm a pianist and coach here at the COC with the Ensemble Studio and today, I want to talk to you about Così fan tutte. Così fan tutte was the last collaboration between librettist Lorenzo da Ponte and composer Wolfgang Amadeus Mozart. It tells the story of two young men, Guglielmo and Ferrando, who believe that their their lovers, Fiordiligi and Dorabella, would be faithful to them, no matter what. Cue the older libertine, Don Alfonso, who is much more skeptical of that. So, they make a bet to see who is right. With the help of the ladies’ fiery maid, Despina, the two men pretend to go off to war, come back dressed up as foreigners, and then try to seduce each other’s girlfriends – and they succeed. The story obviously left a bitter taste for generations of audiences. So, for centuries the work fell into relative obscurity. Yet, despite its subject matter, the music Mozart wrote for the opera is so incredibly poignant that, for many, that alone is able to redeem it. In the last 50 years, the work has come back to the forefront of the operatic repertoire and it is now one of the most often programmed pieces in opera houses the world over. And personally, Così was one of the first operas I ever saw as a child, and I remember its music immediately ensnaring me. So today I’d like to share with you my favorite moments from the work, and show you why this music has so rightfully survived the test of time. The phrase "Così fan tutte," translates roughly to “As such, they all do.” In the opera, it’s supposed to refer to the fickle nature of women’s hearts. We hear the phrase sung by the three men near the end of the opera. Musical excerpt: "Tutti accusan le donne"
But this is not the first time Mozart set these words to music. It is actually a line sung by Don Basilio in Mozart’s and da Ponte’s first collaboration, The Marriage of Figaro. Mozart, always being the clever jokester that he was, combines these two themes in order to write his overture! Have a listen. What often surprises me about this opera, is how both da Ponte and Mozart tread a very fine line between sincerity and irony. So often, the characters are placed in incredibly contrived situations and more often than not, the words they use are equally as contrived. A lesser composer would have made a farce of this score, but not Mozart. Even when dealing with such subject matter Mozart imbues his music with genuine emotion and you notice this particulary in the “parting scene” in the first act. In this excerpt, our lovers are saying their final farewells before the men leave for war. Both the ladies and the men are sobbing, and Mozart writes this musically by writing rests in between every syllable they pronounce — as if it were too difficult to utter words. The only character who sings fully and easily is Don Alfonso, who, as an aside, is mocking the lovers. This combination of textures creates incredible atmosphere — have a listen. Musical excerpt: "Di scrivermi ogni giorno"
Once the men have left on their war ship, the three remaining characters — Fiordiligi, Dorabella and Don Alfonso — sing a prayer together, wishing Ferrando and Guglielmo fair voyage. This trio, entitled, “Soave sia il vento,” is one of the gems of the operatic repertoire. Two particular moments stand out to me, both related to the word “desir” (desire). Mozart prepares these moments as a simple cadence. 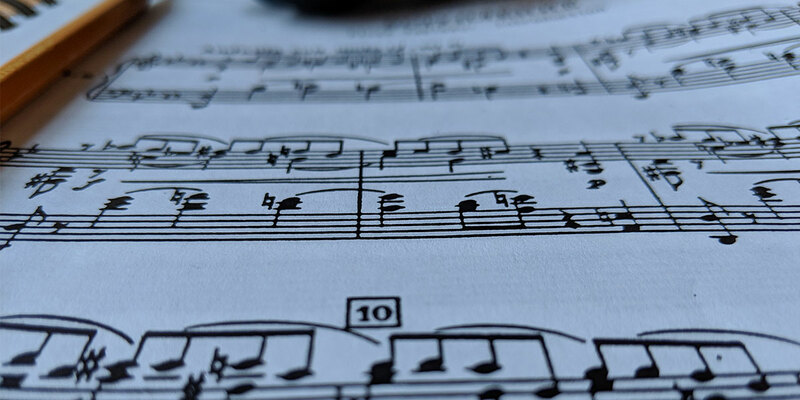 A cadence is what makes a musical phrase feel finished. It's like the punctuation mark at the end of a sentence. Mozart uses this device on the word “desire” not once, but twice! And both time, he lands on a very dissonant and unsettling chord. And to heighten the emotion further, he evades the resolution once more, creating more tension by making the singers sing higher and louder. Once we finally get to the expected resolution chord, a whole page later than we initially expected, we feel relieved — as if the clouds had finally cleared and the sun was finally free to shine through. Have a listen to this incredible phrase. Musical excerpt: "Soave sia il vento"
In this opera, da Ponte presented Mozart with a very diverse cast of characters. We have the proud Fiordiligi, the temperamental Dorabella, the romantic Ferrando, the smug Guglielmo, the cynical Don Alfonso and, last but not least, the feisty Despina. Despina always steals the show in my opinion. She is the only “lower” class character in the opera and she was created to appeal to the general public. As such, her music is also meant to represent the “lower” class. The melodies she sings are simple, and the rhythm underpinning it often has a lilt to it, like a peasant dance of some sort. Have a listen to a bit of her first aria and you’ll hear what I’m saying. Musical excerpt: "In uomini, in soldati"
As you can hear, Mozart is a master when it comes to writing character-specific music. But what happens when a character changes throughout the course of an opera? Does their music change as well? To answer that, let’s listen to bits of Dorabella’s two arias. In the first aria, Dorabella is throwing a temper tantrum and grieving the loss of her lover. The music is tempestuous yet elegant, passionate yet restrained. However, later in the opera, Dorabella lets loose and joins Despina’s camp! As soon as she stops acting like a noble lady, her music shifts dramatically — it now sounds like something Despina would sing: a simple tune, in triple meter, with a jaunty dance rhythm underneath. Musical excerpt: "È amore un ladroncello"
I hope this short explainer of Mozart’s Così fan tutte has whet your musical appetite and will help you better appreciate what you hear when you listen to the opera in person! The cast that the COC has assembled is so talented – they’re up to meeting every challenge that this score presents. Unfortunately for Mozart, the original cast for the premiere of Così fan tutte was not able to meet one specific challenge in the opera. Mozart wrote a fugato for the Act II finale. A fugato is a passage of music where one melody is passed from voice to voice, in an imitative fashion. This section actually proved too difficult for the original cast to perform and it had to replaced with something “simpler” just a few days before the premiere. So as a final sendoff, this is that section, the Larghetto from the Act II finale. Thank you and see you at the opera! Thank you for joining us for Mozart's Così fan tutte.